From our experiences, to make change happen requires shifting individual mental frames first. Our powerful in-person workshop content is focused on fostering inclusive synergy and has been designed by male and female executives to appeal to all gender’s learning styles. Our workshops are typically facilitated by a mixed-gender team and center on interactivity and open discussion. We prefer to customize them to produce deliverables that fit with your specific circumstances and objectives. And the last thing we believe women need to become is more manly. Our most popular current offering combines two intersecting topics we believe are critical to establishing and growing cultures of belonging based on Inclusive Synergy: Bias and Boundaries. 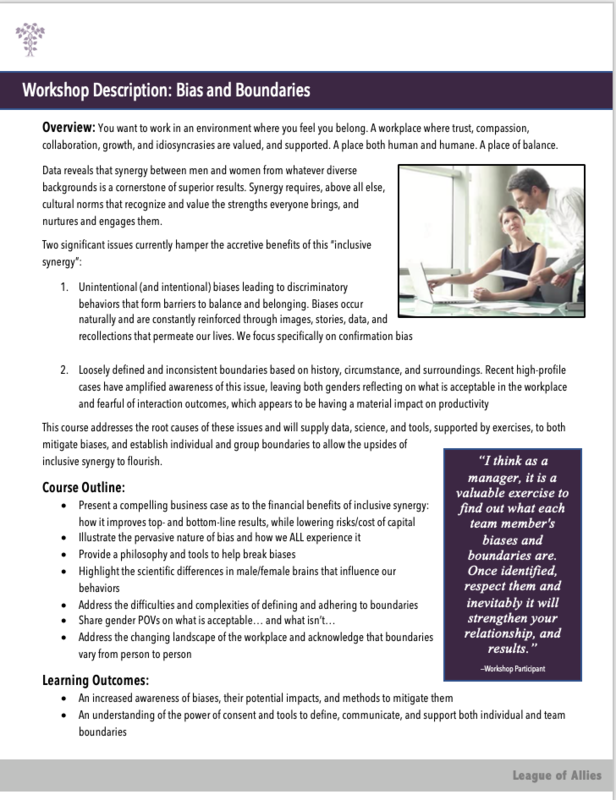 Click here to download a one-page overview of the workshop.